More strikes and riots in Bangladesh - garment workers take the offensive again! Seven garment factories were severely damaged, while bosses claimed 100 other factories were vandalised; three shopping malls and 50 vehicles were also attacked on Tuesday (10th Oct) as thousands of striking garment workers fought pitched battles with the police and factory security forces in and around the capital, Dhaka. Over 100 people were injured in the clashes. At 9am workers poured out of their factories in their thousands, marched to other factories still working and closed them down. Refining their tactics, they broke into smaller groups, attacking and looting factories and businesses. Vehicles were set on fire and roads blocked; due to force of numbers, the police could often only stand by and watch as workers attacked their bosses' property and looted. The main police tactic appeared to be to restrict movement of the demonstrators and contain the crowds within a limited area. Cops and workers clashed several times in different locations, with numerous injuries on both sides and 35 teargas rounds being fired. Eventually a massive force of Rapid Action Batallion (RAB) paramilitaries and police reinforcements managed to regain control by 12.30pm. In Uttara, a northern suburb of Dhaka, thousands of workers seized the Airport access road in the morning and a pitched battle ensued with cops, as a main traffic intersection "became a battlefield". Police baton-charged the crowd, "fired 100 rounds of teargas cells and 60 rounds of rubber bullets on them", leaving more than 50 workers and cops wounded. Workers looted offices, a supermarket, bank, filling station and other businesses. They also torched and damaged dozens of vehicles. Once again, a massive deployment of RAB and cops restored order by 12.30pm. In Narayanganj, a river port town close to Dhaka, several processions of workers also clashed with cops. 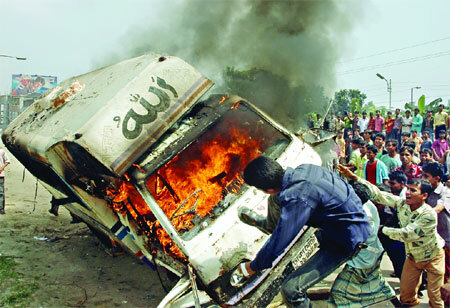 At Savar, 24km northwest of Dhaka, vehicles were damaged and 25 garments factories attacked by workers. "Police arrested 15 workers, including Savar’s regional leader of the National Garment Workers United Forum, Harunur Rashid, from the scene. After hearing that Rashid had been arrested, the workers hurled brickbats at Cannon Garments Ltd, Apparel Ltd and JK Garments near the bus stand. The garment bosses' federation, BGMEA, has demanded that the Government arrest several union leaders they have named as supposed instigators of the unrest, who they claim are in the pay of foreign sources. This same absurd claim implicating India and/or other commercial rivals as the root of the troubles was made after the May-June revolt, conveniently absolving garment bosses from any responsiblity (and playing on time-honoured paranoia and prejudice against regional neighbours). A spokesman for the employers threatened a lockout of the workforce if unrest continues and the Government fails to contain the agitation. "If steps are not taken, we may close down our factories together for an indefinite period". Factory owners have already tried this at several factories in an attempt to starve workers into submitting to worse conditions. "“The ultimatum is to protect the industry,” claimed the BGMEA president. Meaning, to protect its bosses' profits. A decision on the lockout is expected today, Thursday. Also on Tuesday, a national rail strike ocurred against the proposed privatisation of the industry. Workers blocked tracks across the country. One station master was severely injured by angry passengers when he refused to let a train proceed on a blocked track; another had his Stationmaster's office burned by strikers when he attempted to move trains thru his station. There have also this week been several more clashes between demonstrators protesting about the continuing power cuts (see previous reports here) across Bangladesh. The opposition parties are trying to exploit the issue, and assume leadership of the protests, for maximum political gain in the run up to the general election in the New Year.